Thudguard® is made of a high Impact Absorption Foam moulded from Ultra High Density Foam for superior protection. Thudguard® gives a Pre-Curved, Supreme comfort and flexibility for a more personal fit allowing for additional comfort and energy absorption. Thudguard® helps cushion the forehead, side and back of the head. It is made from ultra lightweight High Density Foam and medium weight, soft-spun poly / lycra. This makes it ideal for stretching and keeping the shape of the helmet allowing it to be very durable and easily kept clean. 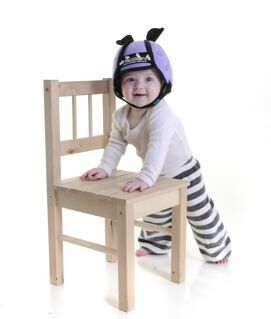 Thudguard® is the only baby head guard that complies with a specially written impact test specification. For example, we have all seen the television adverts where the crash test dummies in a car are put through rigorous impact testing.